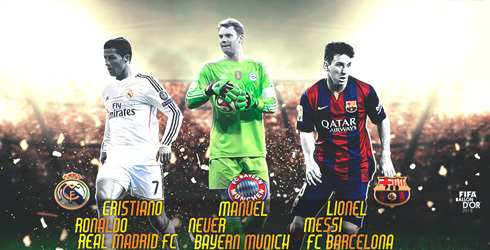 ﻿ Can Ronaldo win back-to-back Ballon d'Or awards? 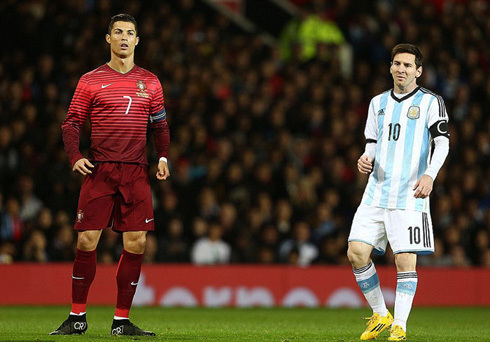 11.12.2014 » Can Ronaldo win back-to-back Ballon d'Or awards? 2014 was the year where not only Ronaldo finally won La Décima with Real Madrid, but where he also went on to break record after record, almost at the same pace as he kept scoring goals. The FIFA Ballon d'Or ceremony is approaching day by day and judging by his numbers, Cristiano Ronaldo could very well be on the verge of winning his first back-to-back Ballon d'Or awards. 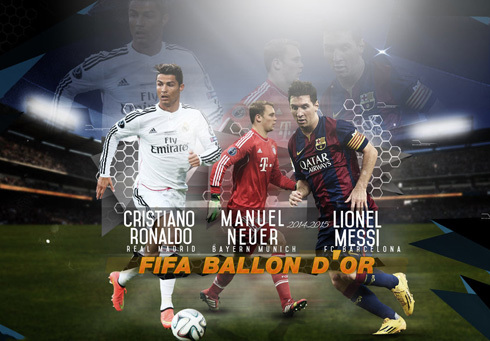 Being nominated for the 2014 FIFA Ballon d'Or represents yet another wonderful year for Cristiano Ronaldo, who shows no signs of relenting in his personal pursuit to become the best player in the modern day era. Retaining the award he received last year would certainly help his cause, with the Real Madrid and Portugal star already considered one of the best players to ever grace the beautiful game. Although he was unable to lead his nation to glory at the 2014 FIFA World Cup in Brazil, Ronaldo has been in unstoppable form at domestic level and has been the focal point for Real Madrid's record-breaking run of 19 consecutive victories in all competitions. Many bookmakers have immediately opened a market following the announcement of the three players who are shortlisted for the award, with Ronaldo strongly backed to win the prestigious trophy once again, ahead of his fellow nominees Lionel Messi from FC Barcelona and Bayern Munich goalkeeper Manuel Neuer. Scoring 59 goals in as many games during the calendar year represents a wonderful achievement for any player, but for Ronaldo, it has become a healthy habit. He has been in unstoppable form for Real Madrid under Carlo Ancelotti, who has created one of the best attacking forces in world football, with CR7 scoring 54 goals in just 48 games. The other 5 goals arrived in 9 appearances for the Portuguese National Team, 3 of which were during the World Cup where he soldiered on despite carrying an injury and scored once against Ghana. Only Jonathan Soriano of Red Bull Salzburg and Barcelona's Lionel Messi got close to score the same number of goals as Ronaldo in 2014, but it is his sheer power, pace and lethal eye for goal that sets him apart from the rest. Ronaldo and Messi may be on another planet to every other player in the modern day era, but the former has arguably pushed ahead in the race to be crowned the world's best player. While the Barcelona star has shown signs of returning to his best this season, Ronaldo has merely kicked it up a notch; 23 La Liga goals in just 13 games puts the Real Madrid star on par to surpass his own record of 46 goals achieved during the 2011/2012 season, and potentially beat the 50 goals scored by Messi in the same year. He has also recently joined Messi in becoming the second player in La Liga history to score against every single team, just to set yet another record in his illustrious and successful career. Winning the La Liga title and the Champions League trophy has made Ronaldo hungrier for success, but retaining the Ballon d'Or is not a foregone conclusion by any means. Messi is only 3 behind Ronaldo in the total number of goals scored during the calendar year, with the mercurial Argentinian returning to his very best in recent weeks. Although the Barcelona star has arguably been below the unparalleled standards he has set himself over the years, he remains one of the best players on the planet and rightfully deserves his nomination alongside Ronaldo. 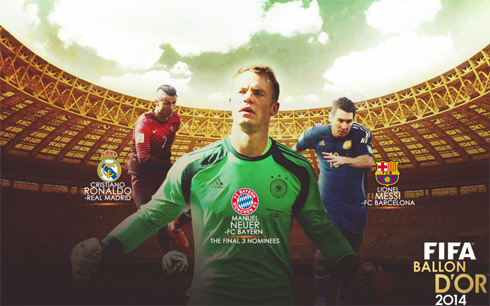 The inclusion of Neuer in the shortlisted names for the award not only symbolises the considerable force of German football at domestic and international level, but also represents a piece of history for one of, if not the, best goalkeeper in the world. 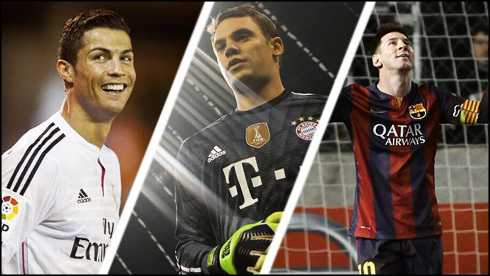 Neuer is the first goalkeeper to be nominated for the Ballon d'Or since Gianluigi Buffon in 2006 and could follow in the footsteps of Lev Yashin who won it in 1963, and may arguably be Ronaldo's greatest threat for the award. The 28-year-old has developed into a top goalkeeper and will end the year with a Bundesliga, German Cup and World Cup winners medal to his name. Cristiano Ronaldo next game will be a La Liga fixture against Almeria, scheduled for this Friday, December 12. You can watch Juventus live stream, Almeria vs Real Madrid, Getafe vs Barça, Chelsea vs Hull City, Arsenal vs Newcastle, and Augsburg vs Bayern Munchen, all matches provided from our football live game pages.